The BM 25 packs the benefits of a fixed system area monitor into a rugged, user-friendly and transportable instrument. It was designed to detect one to five gases for mobile or temporary work applications, team protection, area surveillance or places where fixed detection systems are not suitable. Powered by a NiMH battery pack, the BM 25 multi-gas monitor offers up to 170 hours of continuous run-time. Other standard features include STEL and TWA values, as well as a data-logging capacity of more than four months. 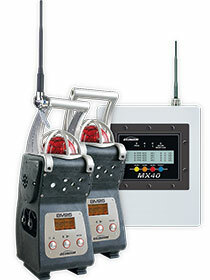 Multiple units can be grouped using optional alarm transfer kits. This protects larger areas by transferring alarms from one BM 25 to the next. An intrinsically safe trickle charger is available to maintain battery life for long-term area monitoring in classified zones. The BM 25 is durable and versatile. It is suitable for a wide range of industries, including petrochemical, refineries and pharmaceutical production. Procedures such as plant maintenance shutdown sites, rig overhauls and perimeter-line surveillance can now be safely performed. The MX 40 controller was designed to centralise the information transmitted by the BM 25 over a wireless network and can display up to 32 measurements in real time. When a BM 25 signals an alarm, the MX 40 also goes into alarm mode and can, for example, control internal relays and order other monitors to transmit the alarm. Any five of the following gasses can be detected simultaneously: AsH3, CO, CO2, Flammable Gas (H2, CH4, Pentane, etc.) HCI, HCN, NH3, NO2, O2, PH3, SiH4, SO2. Oldham gas detection products meet all major international certification standards and are used in numerous industries. Applications include oil and gas, offshore exploration and production, petrochemical, food and beverage, water treatment, automotive, steel production, liquid natural gas, liquefied petroleum gas, pharmaceutical, power stations and many others.